Today’s post is going to be short, sweet and to the point, just like the recipe itself. This is one of those recipes you can throw together when you’re short on time, ingredients and the will power to put much effort into dinner. Another bonus is that it’s pretty light and won’t leave you feeling lethargic afterwards. Winning all around. Try my new shrimp wraps recipe the next time you need a quick go-to lunch or dinner. Place the frozen shrimp in a bowl of warm water to thaw them for at least 20 minutes (or defrost them more slowly in the refrigerator beforehand). While the shrimp thaw, finely chop up the bell pepper and peeled cucumber, and roughly chop the salad greens. In a small bowl, whisk together 1 tbsp. of olive oil with the mustard and balsamic vinegar and set aside. Once the shrimp have thawed, remove the tails, then place them in a hot skillet with the remaining olive oil, garlic and lemon juice (this helps get rid of any fishy smell) and saute for 3 – 4 minutes until the shrimp are pink and cooked through. 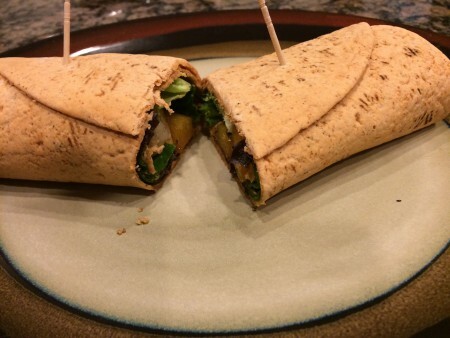 Lay two wraps flat on plates. Toss the salad greens, cucumber, bell pepper and craisins with the dressing in the small bowl then divide it up evenly among the two wraps. Place the cooked shrimp on top of the veggie mixture and top with the shredded cheese. Secure the wraps together with two toothpicks and slice in half. Serve with hummus and carrots on the side, chips or fruit. Dinner’s ready. Dinner’s ready in no time flat. 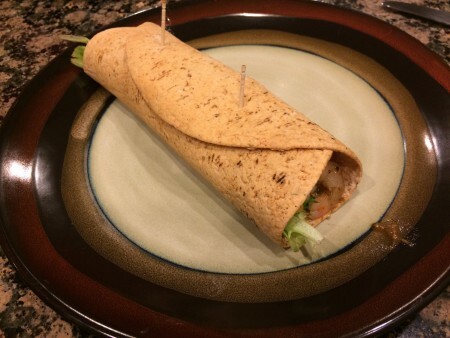 This entry was posted in Entrees, Recipes and tagged Easy, Entrees, Healthy, Low Cal, Low-fat, Quick, Recipes, Shrimp, Shrimp Wrap, Wrap on February 4, 2015 by Paige N..